MesDessous.fr has created this category of homewear and nightwear for men so that you can find easily all types of model of night lingerie or loungewear suitable for you. 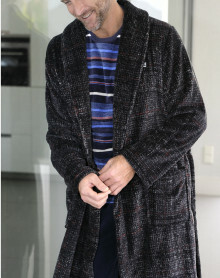 You will find here all the styles and forms of pyjams for men but also a large choice of bathrobe and fleece. Finally, we have selected loungewear for men perfectly cocooning to be soft and comfortable homwear. We offer you numerous brands like HOM, EMINENCE, EDEN PARK, ATHENA. Nightwear and homewear There are 44 products. This boxer is a Diesel innovation, this Hero Fit boxer offers a form sculpting material Modal high-end naturally breathable for comfort while finesse and freshness. The pleasure of going home and donning an indoor outfit where you feel comfortable is more and more shared by men. This is the cocooning effect. The homewear or indoor clothing did not exist 40 years ago. The men switched from his clothing of the day to pyjamas to going to bed. These times have changed and the big brands of men's underwear have understood this by distinguishing nightwear and indoor lingerie. Indeed, a pajama is not necessarily an outfit for watching TV or books in its garden and vice versa, an interior suit is not necessarily made to sleep. HOM brand velor outfit or an ATHENA jog are not made to sleep because they are too warm. On the other hand they are perfect for long winter evenings. Whether you're looking for a pair of pajamas, bathrobes, interiors or leggings, Mesdessous.fr offers different brands so everyone can find what they're looking for. Models such as MASSANA, HOM, ARMANI, EDEN PARK, EMINENCE or ATHENA will make you rediscover the desire to stay under the duvet or in a cocooning moment.